How much does it cost to sail around the world? We hope to find out and will share what we learn along the way. After a year of sailing, we have learned a lot about what we need to be happy and to no one’s surprise, it doesn’t take much. After living the majority of our lives in a consumption-based culture it has been a refreshing change of pace to stop the accumulation and enjoy what we have. We have sailed over 9,000 miles in our small 175sf home to 6 different countries and have done our best to take advantage of what we enjoy the most, Time. Time in nature, Time with friends and Time with family. All of these important aspects of life come with no financial burden, but unfortunately, not all of life’s needs are so unrestricted. For the rest of our requirements, we have done our best to track our cost in a hope that by sharing the information we might help others understand the financial necessities of this particular lifestyle. Below is a summary of the financial costs incurred over the past 12 months. Understand, it was not our goal to live a life of luxury or to spend as little as we could, but simply to live a comfortable lifestyle and enjoy the time we had. Just like back on land, we cook most of our meals ourselves. This was an obvious place to keep our cost down in most countries. Mexico was a great place to shop for groceries, cheaper and better quality than back in the United States. Overall, I think we did a fairly good job finding quality provisioning shops even if it meant going the extra distance. Long bus rides and crazy Taxies are just part of the process. Not much, we really enjoyed shopping locally and finding new dishes to make. It was a BIG challenge in the south pacific to find good veggies, but other than the higher costs in places like French Polynesia, it has been good. Our only regret on this subject is not buying more food in Mexico before we left. We provisioned for approximately 3 months and we wish we done it for closer to 9 months. Especially on the cheap Mexican beer. Beer in Mexico cost about 65 cents per can, while in French Polynesia it was over $3.50 a can at the grocery store. This was an area of our budget that ended up way above our expectations. Looking back in really came down to all the places we stayed on the West Coast of the United States. Many of the places do not allow for anchoring and the high cost of a slip really surprised us. WE BOUGHT A ROCNA, I can’t say enough about our Rocna anchor. It has held us in just about every condition you could imagine. We have 200 ft of 3/8”HT chain and the combination of anchor and chain has never let us down. This comfort on the hook allowed us to feel confident staying out longer and keeping away from the dock and its fees. If we were to do it again, we would have done better research before we left port for the next anchorage. This might have saved us a few bucks while we were back in the US. Boat maintenance was always in the back of our mind as an unknown. You never know what you might need to fix. Luckily for us, we didn’t have a lot of work outside of the typical oil and filter changes. Our biggest cost was a new Dodger while in Mexico ($1,000) and several new lines we purchased before we left for the Pacific. Before we left we installed several new systems on the boat. Doing this right the first time and in a place with easy access to parts was a major benefit. We left Seattle with a boat in A+ shape and this helped keep projects down along the way. But even more importantly, we bought a small boat. Each time we had to fix something or have something done on the boat, it was a fraction of what it would have been if we had a boat even 10’ longer. We spent several hundred dollars trying to get a used water maker to work. Never needed it (in the areas we traveled) and never should have spent the time and money working on it. This amount covered the cost of both our Boat insurance and our Medical (IMG). Both have high deductibles but would cover our butts if anything serious happened. Luckily, we never needed either of them. Aksel had 6 stitches at the local clinic while we were in Mexico and the total was around $300, therefore we never bothered with insurance. We also had some prescriptions refilled in American Samoa that totaled $80, including the Dr. visit. We think we did right by having insurance in case the worst should happen. We feel we have worked too hard on assets back on land to lose them due to an accident or a sudden serious illness. Finding high-quality fuel has been easy in most places in the Pacific. We only carry 60 gallons of fuel but we have not had a problem finding it when we needed it. The average fuel cost has been about $4.75 per gallon but we have seen it over $6.00 per gallon in French Polynesia. Again, owning a small boat has its benefits. Our 27HP Volvo uses about a ½ gallon per hour and we can motor nearly 500 miles on the 60 gallons we fill up with. We have heard of several another boat that uses nearly 3 times this amount and we have been shocked to see some other sailboat fill up with 500 gallons of fuel at a time. Another trick we learned is that motoring at 1600 rpms we use less than half the fuel we consume yet go ¾ of the speed. Not always the best for all diesels but it works for us. Sometime in an effort to save fuel, we would sail when we really should have motored. Sailing at 2kts when you are 20 miles from the anchorage you are trying to get to by sundown is not always the best idea. Strangely this is one area we should have spent more money. Our main costs associated with communications has been the use of our InReach device. This allows us to text any email or cell number from anywhere in the world. It has been a great tool to have onboard and a great help getting weather updates. We sold our IridiumGO. We bought a used IridiumGO before we left Seattle with the intention of paying for the unlimited plan for slow satellite internet. This would have cost at least $150 per month nearly $1200 per year more than what we ended up paying. Obviously, there would have been some benefits to having it, but overall it wasn’t the product for us and we were glad to buy sim cards and Wi-Fi Hotspots when at the port at a far lower cost. If we were to do it all again we would go with the same InReach plan and change nothing. When in Mexico, eating out was almost an everyday occurrence. The three of us could have tacos and beers for less than $20 so it was easy on the budget. Once we got to the Pacific islands, that changed quickly. It has been rare for us to find a meal for the 3 of us that was under $50. And to be honest, with the exception of one or two places, the food quality wasn’t worth the cost. Towards the end of the year, if we ate out it typically was at a food truck or just getting a snack while out exploring a village. We also have started to enjoy saving our eating out budget for higher quality meals. When eating out was cheap and good we did it, when it wasn’t we didn’t. There were several times we considered going out in French Polynesia, but $30 for a burger was just more than we could justify. But at other times we dropped over $100 on meals that we will remember for the rest of our life. Overall, we think the key for us was finding a good balance. Let’s be honest, we should have eaten even more tacos and drank more beer while in Mexico. When checking into a country you never know what costs you will face. You can do all the research you want, but until you show up at the border, you just never know. Entry fees change all the time and it’s nearly impossible to keep up with them all. Canada and French Polynesia were 100% free to check in and out of while the other countries all had some fee ranging from $27-140. Even the USA charged us a customs fee to come back into the country from Canada. One funny side note, the fastest check-in time was in Canada, it took less than 5 minutes. Our longest check-in time was in French Polynesia, it took over 5 days because we showed up over the long Easter weekend. We never hire an agent to help us check in. This sometimes makes it more difficult or takes us a bit longer, but it saved us several hundred dollars. Even when you don’t speak the language, most officials are incredibly nice and very helpful. We were never once asked to bay a bribe or any “extra” fees that they wouldn’t give us a receipt for. Overall it was a good experience and one that didn’t require paying for additional help. When arriving in a new country you are required to have copies of all your documentation, this was something we knew and had a dozen copies of everything ready to go… except for our crew list. For some reason, we always kept forgetting to do this so we ended up filling one out by hand every time. It only took a few extra minutes, but the more prepared you are, the more professional the officials will treat you and the faster the transaction takes place. It never really caused a problem but would have been nice to have. This has been a catch-all for items that don’t come up very often or that were too difficult to put into another category. They include items such as trips home to visit family ($1500), tattoos in French Polynesia ($700), taxi rides, pearls from the Tuamotus ($280) and other assortments of purchases. Looking back we might have done a better job of adding more categories, but this worked for us at the moment. Getting tattoos after crossing the Pacific was a big one and we are really glad we found a great artist at a reasonable price. This is obviously a long-term commitment and some things you just don’t want to do on the cheap. Overall this was where most of our surprise costs came from. We were more than happy to have spent the money on these items, but we should have done a better job of anticipating these types of expenses in our early budgeting. Adding a 20% line item would have been the smart thing to do when planning out the financial side of our trip. In one year we have spent just under $2,000 per month, $500 over our original goal of $1,500. The topic that always comes up when discussing our finances on the boat is, “How can we get back on budget?” And after much debate, the answer is quite simple, Travel to cheaper countries. Many of the built-in costs such as food, boat maintenance, and fuel are based on the local economies we find ourselves in and won’t significantly change with altered spending behavior. Traveling home less often, getting fewer tattoos and not buying pearls are easy ways to save and will not be in our budget next year. But other experiences and adventures will be and we will make sure to account for them beforehand this time. We will also be traveling to more expensive countries for long periods of time, making for the significant strain on the budget. But in the end, it is Time that we are after, not Things, so I am certain we will find a way. Back on American Soil. And what is more American than a trip to Costco (Cost-U-Less in this case) We loaded up on over $600 of comfort foods like trail mix, Pancake mix and RedVines. We also bought a lot of food for meals but we only remember the good stuff. We spent the month in the Tuamotos, a serises of small atolls in the middle of nowhere. Not much to spend money on but we did go to a pearl farm and spend nearly $300 on black pearls. This month we spent the majority of our time in the Marquises. Not exactly a cheap place to be, but we did our best to keep the costs down. Our BIG expense came in the form of 2 traditional tattoos that cost nearly $700 in total. This was by far our lowest month so for.. but we also spent 25 days crossing the pacific ocean during the month. Its a good thing after last months spending. This was our last month in North America and boy did we overdue it. 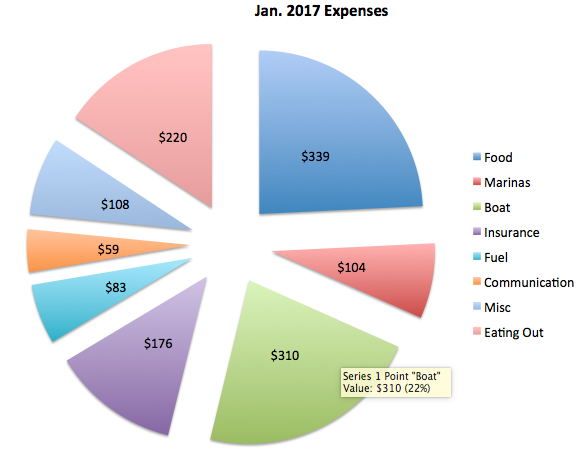 This months expenses included several extra bits of boat gear and spares as well as a significant amount of overspending on marinas and fuel. It also include over $1200 spent on a trip back to Seattle for Aksel and April (the last cheap place to fly home from). January brought a new year as well as a new record low on spending for a month. We had a great time moving from La Paz to La Cruz with stops in Mazatlan and Isla Isabella. Some of the best snorkeling and relaxing days spent at anchor yet. Overall our average monthly saving is round $1700 per month and is getting closer and closer to our goal of averaging $1500 for the year. From here on I think we can start to maintain our monthly financial goal and stay on track to for our long term traveling goal. Damn you California… You’re killing my budget. Well, it wasn’t as bad as it could have been, but we went well over our budget this month. The biggest hit to the budget were marinas. We found that several of the spots we wanted to hang out didn’t have safe anchorages (contrary to our cruising guides suggestion). We also took a 30% increase per gallon in fuel and spend an unreasonable $150 for the 3 of us to go to the Monterey Aquarium. Something I would defiantly do again, but it was a lot of cash to drop for a few hours. We still have 1 more month in the US before we hope to get the cost down in Mexico. Wish us luck. All Food we purchase to prepare ourselves on the boat. This cost is associated with any costs related to parking the boat for the night. This line item covers all boat maintenance or upgrades. This covers all miscellaneous items such as laundry, car rentals, or any other item that is not easy to categorize. This is the cost of all eating out at restaurants and/or coffee shops. It also includes snacks we might buy while not on the boat. The insurance line item covers both Health Insurance and Boat Insurance. This covers two cell phones, satellite texting and weather information. This is for all cost associated with checking in or checking out of a country. 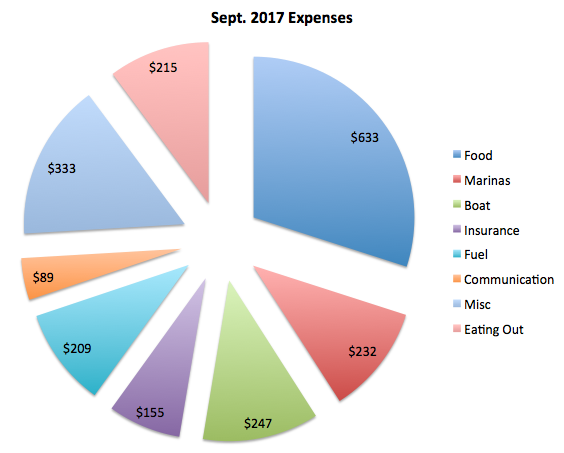 Knowing that our average budget for our trip is $1500 per month, this month was a pleasant surprise, even though we spent above our budgeted average. 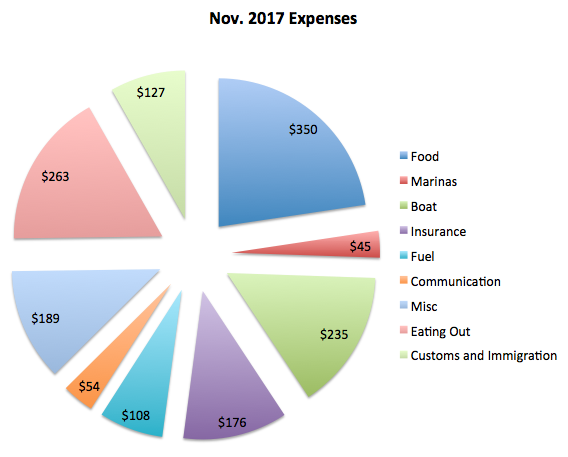 This month’s total was $1,844 and covered two weeks of cursing in the San Juan’s and Gulf Islands as well and a couple of weeks held up in marinas as we waited for storms to pass as we moved down the west coast of the United States. The US will be one of the more expensive places we travel over the next few years and with any luck, by keeping our costs down here, we will have no problem once we leave to lower cost destinations. The cost of updating a boat to prepare it for long distance blue water cruising will differ for each boat and each family. But this is what we choose to meet our needs best. We realize we could easily have done it for a fraction of this cost or spent 2 to 3 times this amount. We found this to be our comfort zone with enough bells and wistles to be both safe and comfortable from our perspective. Below is a list of the significant items we upgraded.